MORE top 10 hiking towns worldwide? I posted our top 10 hiking towns worldwide based on some quite vague criteria. I’ve personally hiked out of all 10 of those great towns in recent years. But there might be others just as good … or better. Of those 10, El Calafate and Moab are the two that might be replaced. David suggests Sun Valley / Ketchum, Idaho. Mark recommends Springdale, Utah, just outside Zion National Park. The USA has the best hiking in the world, under represented on our list of top 10 towns. But what’s a hiking town USA better than Moab? My first pick is Yosemite Village. Wonderful … but is it really a “town”? Almost nobody would dispute Banff / Canmore on the list. 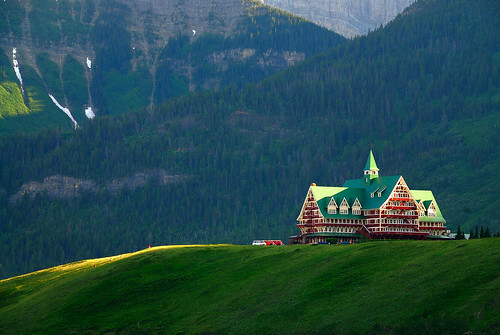 But I personally prefer Waterton townsite. It’s a true town compared with Yosemite. In fact, it would be the #1 town on my personal list. I’ve never hiked the N.E. USA. … What about Lake Placid or Keene, New York? In Argentina you can make a good argument for Bariloche. You can take a city bus to some of the best hiking in South America. There must be more good candidates. Leave a comment if you have a suggestion. That list is not carved in stone. … Yet. I certainly thought of Yosemite Village also – top 3 easy ! – but also felt it wasn’t what you meant by “town”. East – North Conway NH is arguably the center of the NE culture while Asheville NC certainly holds that spot for the SE, but while I’ve had a pile of fun there and it definitely has the most history in the US, the former can’t quite make the the top ten on my list and the latter definitely can’t. Desert – I might have put Springdale on my world best list if I had remembered it. I drive right thru Moab without stopping on my way to Zion. West Coast – Leaving out the Sierra’s would be a travesty; worlds best granite, perfect weather, way bigger wilderness than anyone realizes. Bishop on the east, Nevada City on the west side. Leavenworth is the gateway to the Cascades. Rockies – Boulder easily tops my list, but for those on a one week visit, Crested Butte and Telluride are incredible, with Ouray actually being the best middle ground between vacationing and living. Sun Valley has good proximity to the Sawtooths, but just isn’t that pretty or nice a town; I would go for Jackson WY instead. Thanks for the stimulating conversation! Answers obviously depend on what one likes: short vs multi-day hikes; clearly marked trails vs adventures – and what one is looking for: a place to live year-round vs a weekend visit. I would definitely have to say that Telluride and Ouray are incredible. Both are real towns… Ouray has not been changed by a big ski area either… Ouray is tiny (about 8 blocks long and 8 blocks wide) but mighty, that is for sure. 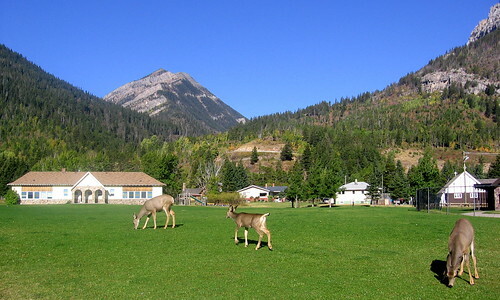 In Ouray, trails leave directly from town and in the county there are over 70 different hikes that can challenge just about anyone. You can bag 14ers or take quick afternoon loops. The scenery is just about as good as it gets. They don’t call Ouray “Switzerland of America” for nothing! You’ve got me convinced about Ouray, Karen. I’m putting it on my LIST of places to hike. Thanks for mentioning my suggestion for Ketchum/Sun Valley! That was a great list of towns that has stirred the wanderlust to keep on exploring the wide-world of trails. Drop me a line any time you make it this way & I’ll share my favorite paths. Happy Trails! I live in Alberta and go to the panhandle all the time. Yet I’ve not hiked much in Idaho. I’d go with Kanab over Moab, but I’m happy to see Utah on this Top 10 List! Happy Holidays, Rick! North Conway, Lincoln, or Gorham, NH definitely deserve consideration. The network of trails through the Whites and surrounding areas aren’t rivaled by many others. I’d argue Pokhara, Nepal over Namche Bazaar. Pokhara is jumping off point for many hikes across the Himalayas (Including the Annapurna Circuit, Annapurna Base Camp, Mustang) where Namche serves only Everest. Good call, spence. … I’m accumulating an honourable mention list, which may be just as strong as the top 10. 1-Cusco – Known as the capital of the Incas, and famous as the ‘base camp’ for Machu Picchu (which you can arrive in 4 different treks), it boasts as a dispatch city for several other amazing treks such as the Ausangate circuit and the exhausting Choquiquirao. 2-Bariloche – Famous for the steaks, chocolate a ice cream, but also located in one of the most spectacular sceneries in South America, from which you can embark on several treks (Nahuel Huapi Traverse, Bariloche Hut to Hut, Cerro Tronador & Paso de la Nubes). Hi Rick, I would add Torla in Spain for some of the best trekking in Europe in Ordesa National Park. We do have the Gavarnie-Ordesa Circuit listed on our page of Europe’s best hikes. I must get there myself one day. Definitely it is one of the best tracks in Europe, if you are interested in Pyrenees you can check Carros de Foc circuit in Aigüestortes National Park too. Regards from Spain!! Springdale Utah has got it all. Steps away from the main entrance of Zion. All the services that hikers require (gear purchase and rentals, showers, laundry, shuttle service to different areas of Zion, great selection of hiking food at grocery store, etc). I even found special rolls of duct-tape, for hikers, at the grocery store in Springdale! Thanks Mark. I’ve added your recommendation to the post. Hi there! Definitely El Calafate is not a hiking town! People go there just to see the glacier. I wonder if you meant El Chaltén, Argentina’s “national trekking capital”, and only 300 km from El Calafate. Believe me, it’s a trekker’s paradise. Famous Cerro Fitz Roy and Cerro Torre are in El Chaltén.